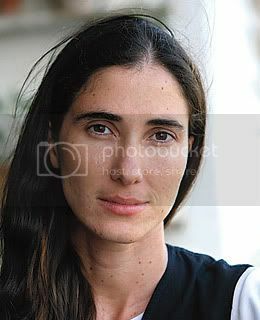 I have been meaning to write about the heavy hammer that is coming down on Cuban blogger Yoani Sanchez. She’s been called in to the police station, her site is monitored, censored in Cuba. A winner of international prizes and recognition for the truths she speaks, Sanchez is a tough and brave broad in one very scary and oppressed place. Chantel over at Yuca Baby posted a summary and link about Yoani’s recent “message in a bottle,” so I am sending you there. Watching her speak gave me the chills. I will make sure I pass this on. Thanks for posting and linking, Carrie. Whenever I see her, I can’t help but feel so small in the wake of her strength. I don’t think I could do what she does. She is a brave, brave mujercita…She’s tasted freedom and she’s gone back to being without it. A huge impossibility to live at peace like that. Gracias, Jujita for reading it and you Chantel for writing about it. I tweeted it and so far one high school teacher is going to share it with her class. Let’s hope the likes of Benicio del Toro, Ted Turner,Spielberg,Sean Penn,and the others that think Castro is the greatest,read her blog. How sad,50 years of misery, and no one listen. Thank you for bringing this out.Maybe there is a way to send her blog to the above people.